Owing to the increased funds diverting towards the development of renewable energy generation infrastructure, the global distribution generation has acquired immense popularity. In the past few years, there is an increased inflow of new vendors and policy makers are more focused towards the distribution generation market due to the constant demand for clean energy. All conductive policies are encouraging the adoption of clean energy and this may be presumed to drive the distribution generation market in the coming years. Various other factors influence the distributed generation market to grow. There is a constant rise in demand for electricity in both developed as well as developing nations for industrial and residential purposes. There is this increasing cost and strict regulations that limits the use of power that is generated from fossil fuels. Development in off-grid locations are also being focused by power distribution infrastructure which further adds to the growth and demand of the distributed generation market. The factor that may restrict the growth of the market is the reluctance of investment in the distribution generation market. However, because of their compact size, practical thermal output and low unit cost, these distribution generation engines are widely used for power generation. Quick and flexible start-up technologies used for generating power are the main reasons that may boost up the demand for distributed generation market in the coming years. The global distribution generation market is presumed to witness a promising growth within the forecast period of 2017 to 2025. It is presumed to rise at US$35.56 bn by 2025 with a CAGR of 8.2 %. 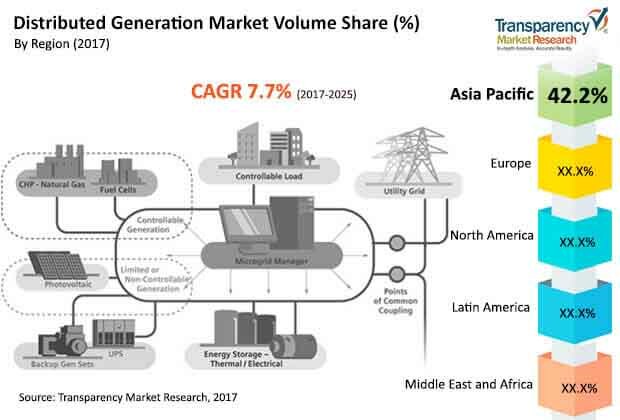 Based on segmentation by technology, the distribution generation market is classified into fuel cells, micro turbines, reciprocating engines, wind turbines, combined heat and power (CHP), and solar photovoltaic. Out of these, the CHP technology characterizes a high quotient of flexibility and may be utilized with alternative energy production technologies like fuel cells, reciprocating engines as well as micro turbines. The carbon emission levels are also low and thus, cost effective clean energy generation is produced. On the basis of application, the market is segmented into on-grid and off-grid application. Based on segmentation by end users, the market is categorized into industrial, commercial, buildings and institutions and residential segments. The global distributed generation market is studies with respect to key geographies Latin America, Europe, North America, Middle East and Africa, and Asia Pacific. Out of these Asia pacific is estimated to exhibit the most promising investment potential over the years. A steady increment in the revenue is expected in the global distributed generation market. Due to the rise in strict implications on environment protection laws, and increased focus on off-grid locations to be provided with energy, the market in Asia Pacific is anticipated to benefit to a large extent. Owing to the vast rise in new solar PV projects and high installed solar PV capacities, the key enablers of growth in Asia Pacific market are Japan and China. Government policies have also enabled positive development of the market in the region, hence increasing focus on developing renewable energy-based generation. The market in Europe and North America are anticipated to face a decline in their share during the forecast period even though they are considered well-developed. Government provides incentives for renewable power consumption as energy-infrastructure encouragements. Strict laws on environment protection have worked in favor of the distributed generation market in this region. Moreover, due to installation of fuel-based energy generation systems and its rising usage, the market in North America is anticipated to create new growth opportunities for companies functioning in the distributed generation market over the years to come. The global distribution generation market is estimated to face high competition with companies like Rolls-Royce Power Systems, Mitsubishi Hitachi Power Systems, Caterpillar Power Plants, Ballard Power Systems, and Bloom Energy. Distributed energy generation is defined as the power generation at the point of consumption. Distributed generation generates power by utilizing various technologies such as solar photovoltaic, wind turbines, CHP (combined heat and power), reciprocating engines, micro turbines, and fuel cells in order to provide on-site power to consumers. Distributed energy generation systems provide clean power by means of renewable technologies such as solar photovoltaic and wind turbines in combination with energy storage systems in order to provide clean electricity to consumers. Distributed energy generation systems based on renewable energy are proving helpful in providing low cost and clean energy to the population living in bad-grid and off-grid areas. Rising demand for power, recovering economies of developed countries, increasing cost of fossil fuels-generated power, growing emphasis on reduction of carbon emissions, and a lack of power transmission & distribution infrastructure in off-grid areas are key factors that are boosting the demand for distributed energy generation systems across the globe. Other distributed power generation technologies such as CHP (combined heat and power), reciprocating engines, and micro turbines are utilized to provide back-up support to the main electricity grid. CHP-based distributed energy generation technology utilizes the heat from waste exhaust gases from gas/steam turbines to generate steam from the boilers, which then run secondary steam turbines in order to generate additional power. The distributed energy generation systems market can be segmented based on technology, application, and end-user. The technology segment can be sub-segmented into solar photovoltaic, wing turbines, CHP, reciprocating engines, micro turbines, and fuel cells. CHP technology can be readily employed with reciprocating engines, micro turbines, and fuel cells to generate clean energy with low carbon emissions and also improve the overall electricity generation capacity. Renewable energy-based distributed energy generation systems of low, medium, and high power generation capacities can generate affordable and low-cost electricity for consumers in off-grid areas. High generation capacity distributed energy generation systems generate grid scale power through solar or wind farms, which can form mini/micro grids in order to distribute low-cost power. Small- and medium-scale distributed energy generation systems can be utilized as roof top solar power generation units to generate independent grid-free electricity for residential or commercial usage. Most distributed energy generation systems are grid connected; however, the off-grid sector is anticipated to provide significant growth opportunities for renewable energy-based distributed energy generation systems in the near future. Distributed energy generation systems produce clean and low-cost power. This generated power is mostly consumed by the industrial sector, followed by residential, commercial, and buildings & institutions sectors. The industrial sector also consumes most of the electricity produced from power plants. Usage of distributed energy generation systems can help provide low cost and clean power to the industrial sector. District heating and cooling services can be provided at cheaper cost, by using CHP and CCHP distributed energy generation technologies. They can also be utilized to provide heating services to the residents, buildings, and institutions during winter time. They can also be employed to provide cooling services during the summer time. Increasingly stringent environmental regulations regarding air emissions, rising cost of fossil fuels-generated electricity, increasing demand for electricity from off-grid areas, and the high cost of grid transmission and distribution infrastructure in off-grid areas are anticipated to boost the distributed energy generation systems market during the forecast period. The report estimates and forecasts the distributed generation market on the global and regional levels. The study provides forecast between 2017 and 2025 based on cumulative installed capacity or volume (MW) & Y-o-Y investment potential (US$ Mn) with 2016 as the base year. The report comprises an exhaustive value chain analysis for each of the segments with detailed list of distributed generation technology providers. It provides a comprehensive view of the distributed generation market. The study also provides the utility scale potential customers for distributed generation. The study includes drivers and restraints for the distributed generation market along with their impact on demand during the forecast period. The study also provides key market indicators affecting the growth of the market. The report analyzes opportunities in the distributed generation market on the global and regional level. Drivers, restraints, and key trends mentioned in the report are justified through quantitative and qualitative data. These have been verified through primary and secondary resources. Furthermore, the report analyzes the cumulative installed capacity addition scenario of distributed generation and Y-o-Y investment potential analysis during the forecast period. The report includes Porter’s Five Forces Model to determine the degree of competition in the distributed generation market. The report comprises a qualitative write-up on market attractiveness analysis, wherein end-users and regions have been analyzed based on attractiveness for each region. Growth rate, market size, impact strength, technology, competition, and other factors (such as environmental and legal) have been evaluated in order to derive the general attractiveness of the market. The study provides a comprehensive view of the distributed energy generation systems market by segregating it into distributed energy generation by technology, by application, by end-user, and by geography segments. In terms of technology, the distributed energy generation systems market has been segmented into solar photovoltaic, CHP, wind turbine, reciprocating engines, micro turbines, and fuel cells. Based on application, the market has be classified into on-grid and off-grid segments. In terms of end-use, the market has been divided into residential, building & institutions, commercial, and industrial. These segments have been analyzed based on historic, present, and future trends. Regional segmentation includes the current and forecast consumption of distributed energy generation systems in North America, Latin America, Europe, Asia Pacific, and Middle East & Africa (MEA). Market segmentation includes demand for consumption in all the regions, individually. The report covers detailed competitive outlook that includes market share, product mapping, and profiles of key players operating in the global distributed generation market. Key players profiled in the report are Alstom S.A., E.ON. SE, Caterpillar Power Plants, Siemens Energy, Doosan Fuel Cell America, Ballard Power Systems, Bloom Energy, General Electrical Power, Sharp Corporation, Enercon, Fuel Cell Energy, Rolls-Royce Power Systems, Mitsubishi Hitachi Power Systems, Americas, Inc., Capstone Turbine Corporation, and OPRA Turbines BV. Company profiles include attributes such as company overview, number of employees, brand overview, business overview, business strategies, recent/key developments, acquisitions, and financial overview (wherever applicable). Porters’ Five Forces and SWOT analyses to make profit-oriented business decisions. They analyze the strengths and weaknesses to gain strategic position in the market.